We spent over 24 hours researching and testing 20 different kinds of disposable razors and found that performance, cost, and quality were most important. The Gillette Sensor2 disposable razor scored well above the others we tested in all categories and is our top pick. The pivoting head that this disposable razor features sets it apart from the others and provides you with a safer, better shave. The lubrication strip and rubber handle give it a reusable razor feel and quality that make using them much better than most disposables. The cost of these disposable razors is another popular aspect of using them. When it comes to getting a good shave, learning how to do it is the most important step. After that, it’s about getting the right razor. In the following review, you’ll see some of the best razors the modern world has to offer. After listing off the three best disposable razors on the market, we’ll offer some tips on how to find the best possible shave when shopping on your own. If it weren’t for its name and packaging, you might for a minute be under the impression that the Gillette Sensor2 isn’t disposable at all. This is due to the razor offering a few high-end features which you’d typically expect to find in a premium, reusable razor. This makes it especially great if you’d like to break away from tending to your reusable razor but are afraid of the lack of features found in disposable razors. What most sets the Gillette Sensor2 apart from products of its type is its pivoting head. Now, if you’ve never used a disposable razor before, this may not sound too exciting. Those who have used disposable razors; however, can tell you that this is a great feature to find in a disposable product. The pivoting head has you feeling as if you’re using a reusable razor, which is a huge plus. It also comes with a lubrication strip and a rubber-laden handle, thus increasing the comfort inherent in its use. If you want a disposable razor with a reusable feel, the Gillette Sensor2 is sure to impress. Back when the disposable razor market was a little less versatile than it is now, many men with sensitive skin found themselves with no other viable option outside of the pink BIC razors made for women. While they certainly didn’t hurt the face, they didn’t always give the closest shave. This is where the Gillette Mach3 Sensitive Disposables come in. If you’ve been staying away from disposable men’s razors due to them rarely catering to your specific skin, this Gillette release may be a breath of fresh air. Much like the previous Gillette product we covered above, you’ll find these razors to offer a very reusable razor feel, perhaps to an even greater extent. They come with a lubrication strip, three PowerGlide blades and a pivoting head. If you’ve been using reusable razors for sensitive skin, you’ll likely notice no difference between your current brand and the Gillette Mach3 Sensitive Disposables. Not only do they cater to sensitive skin, they come with a variety of features which could certainly be considered as being rather advanced when stacked up to other disposable blades. Lastly, we have a set of disposable razors by a brand who’s made itself well-known in the disposable razor market. For some time now, BIC has been covering the essentials through offering a basic-yet-effective solution to pricier razors. They’re back again, this time with something to cater specifically to sensitive skin that, up until this point, was only compatible with the brand’s pink razors. With only two blades and a lack of any heavy materials in the razors, you’ll find them to be quite lightweight as well, which is great if you’re not a fan of heavier razors. While the BIC Twin Select Sensitive Skin is great if you have sensitive skin, you’ll find it lacking in many of the features found in the two above Gillette razors. Simply put, you won’t feel as if you’re using a reusable blade. Although some may find this disappointing, it’s great if you’re the type who buys disposable razors merely for their cost. This is due to the fact that every dollar you put into the purchase goes toward coming out with a blade that does its job, skipping on any advanced features so as to keep the product as frugal as possible. All of the three above razors are excellent choices. While any of them are sure to give you a great shave, picking the best possible one to suit your needs will carry this effect further. 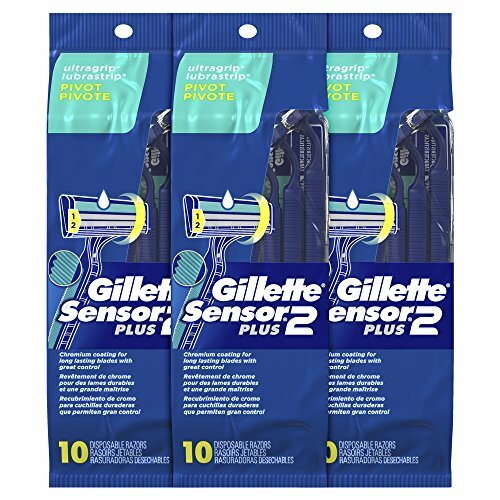 For example, if you have no need for razors made for sensitive skin, the Gillette Sensor2 will give you an extremely close shave that just can’t be beat by many other disposable blades on the market. If you do need something for sensitive skin, opting for one of the other two razors is a good idea. Which of the two you pick all depends on where your priorities lie. Have a taste for getting the best bargain possible? 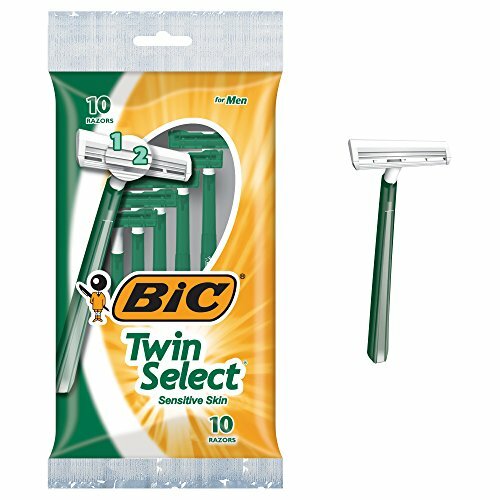 The BIC Twin Select razors end up costing two dollars each. This price goes in contrast to their high level of quality, making it a great-yet-frugal choice. 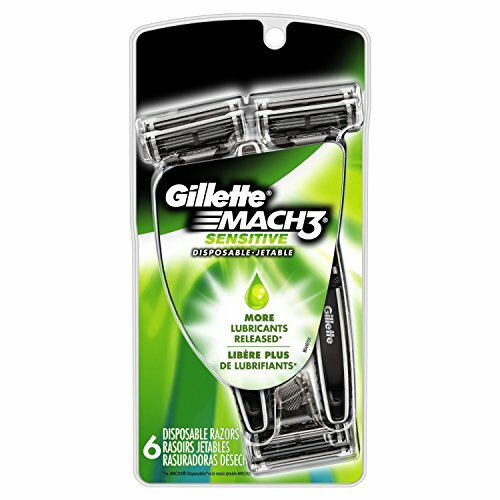 On the other hand, if you don’t mind spending a little bit extra on a per-razor basis and would prefer to get a razor which doesn’t feel like a disposable model, the Gillette Mach3 Sensitive Disposables are likely to give you just what you’re looking for in your next disposable razor. What is a Disposable Razor? As great as the above disposable razors are, you may find yourself interested in shopping on your own. If this sounds like you, keeping the below list of considerations in mind is sure to get you the best shave possible. What is your preferred type of razor? Perhaps you’ve recently switched over from a safety razor or straight razor? Due to vast differences in the way modern razors operate, making the switch can be a little tough at first. While this will be covered in more detail momentarily, I’ll mention that the amount of blades in the razor you decide to go with plays the most important role in getting the most traditional feel you can get out of a modern razor. Typically, a higher blade count translates to a more modern-feeling razor, while less blades will give you an experience closer to that of a safety razor. Do you go through razors quickly? The following rule holds true for both disposable and reusable razors alike. If you go through razors very quickly, this is likely due to hair getting trapped underneath the blades. While you can brush said hair out in a couple of seconds with a designated toothbrush, who wants to do that? Getting a razor which either has one blade or several spaced out blades can remove this issue completely. If you have thick hair or wait a while in between shaves, such a razor should be seen as being downright essential. Otherwise, razors whose blades are more closely spaced will usually offer a smoother shave. Why do you prefer disposable razors? If it’s for the convenience, you’ll have the luxury of choosing any brand you wish. On the other hand, if you buy disposable razors purely as a cost-saving initiative, going with more basic razors is always a good idea. Not only will these typically be lower in cost, they’ll generally give a great shave, being that every dollar you put into the razor will go into the quality of its blade(s) and nothing else. We’ve reached a point in human history wherein razor manufacturers have adopted the habit of constantly trying to fit as many blades as they can into a single razor. As a consumer, it can be easy to get stuck in the more-is-better mindset. However, this is not always the case. Let’s take a look at the difference between razors according to their blade count and find out which count you need. One Blade – This is the most basic type of razor you can buy. However, this does not mean that it’s the worst. If you’ve ever used a more traditional razor (such as a safety razor), you’re likely aware that nothing has the potential to give you as close a shave as the single-blade razor. At the same time, nothing has the same potential to leave your skin feeling like sandpaper as the single-blade razor. Razors with one blade have a steep learning curve, not only for teenagers, but for grown men who have been shaving for a decade or more. After mastering this curve; however, you’ll have the smoothest face on the block. Five Blades – While you may find some razors out there with six or more blades, these are rather rare. For simplicity’s sake, we’ll consider five blades as being the upper limit of what you can expect to find in a modern razor. The master of the five-blade razor simply will not get as close a shave as the master of the single-blade razor. However, if you decide to go with this type of razor, you’ll likely incur a significantly lower amount of razor burns and cuts throughout the course of your shaving career. While it may not have as much potential as the single-blade razor, it operates much more smoothly. Everything Else – Perhaps both of the above blade counts appeal to you, though you just can’t decide which one to pick. If this is the case, you can always opt for a razor who’s blade count lies somewhere in the middle. Typically, these have the potential to offer a smoother shave than the five-blade razor, though won’t be as difficult to master as the one-blade razor. You can go with three blades, or you can lean closer to one particular side of the spectrum. Which of the above types of razors you decide to go with all comes down to want you want to get out of your razor in the first place. Of course, this is rather subjective. The below characteristics; however, are always a great thing to see in any razor. That being the case, it can’t hurt to keep an eye out for them. A Lubrication Strip – There is absolutely nothing wrong with a lubrication strip. While many features may be more suited toward certain people, a lubrication strip is something we can all use. Not only does it allow your razor to glide more smoothly across your face, it keeps your face moist in case you have to go back for a second stroke. As we all know, those second strokes can be razor burn city. A Pivoting Head – You might notice a huge difference after switching to a razor with a pivoting head. On the other hand, you may notice no difference at all. Because a pivoting head has no potential to actually hinder your shaving experience, there’s really nothing to lose by giving these razors a go. A Rubber Handle – Much like the pivoting head, the worst possible thing a rubber handle can do is nothing at all. However, you’ll likely find the increased grip to be a good thing, being that you won’t have to hold it so hard to use it, which may indirectly reduce the rate at which you cut yourself or incur razor burns. Outside of looking for a razor with the three qualities listed above, whether or not a razor will best suit your needs depends on what your needs are in the first place. It goes without saying that some razors will be better than others, though factors such as a razor’s blade count will play a huge role in how likely you will be to stick with your new brand. Keep these factors in mind when shopping for razors and you may very well find cuts, scrapes, bumps and razor burns to be a thing of the past.